Scientists at the Department of Energy’s Lawrence Berkeley National Laboratory (Berkeley Lab) have harnessed the power of photosynthesis to convert carbon dioxide into fuels and alcohols at efficiencies far greater than plants. The achievement marks a significant milestone in the effort to move toward sustainable sources of fuel. Many systems have successfully reduced carbon dioxide to chemical and fuel precursors, such as carbon monoxide or a mix of carbon monoxide and hydrogen known as syngas. This new work, described in a study published in the journal Energy and Environmental Science, is the first to successfully demonstrate the approach of going from carbon dioxide directly to target products, namely ethanol and ethylene, at energy conversion efficiencies rivaling natural counterparts. The researchers did this by optimizing each component of a photovoltaic-electrochemical system to reduce voltage loss, and creating new materials when existing ones did not suffice. That sun-to-fuel path is among the key goals of the Joint Center for Artificial Photosynthesis (JCAP), a DOE Energy Innovation Hub established in 2010 to advance solar fuel research. The study was conducted at JCAP’s Berkeley Lab campus. The initial focus of JCAP research was tackling the efficient splitting of water in the photosynthesis process. 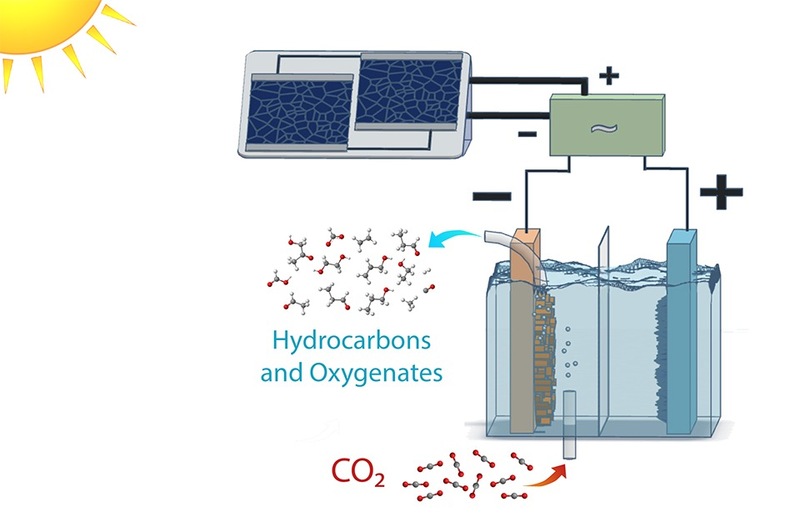 Having largely achieved that task using several types of devices, JCAP scientists doing solar-driven carbon dioxide reduction began setting their sights on achieving efficiencies similar to those demonstrated for water splitting, considered by many to be the next big challenge in artificial photosynthesis. Another research group at Berkeley Lab is tackling this challenge by focusing on a specific component in a photovoltaic-electrochemical system. In a study published today, they describe a new catalyst that can achieve carbon dioxide to multicarbon conversion using record-low inputs of energy. For this JCAP study, researchers engineered a complete system to work at different times of day, not just at a light energy level of 1-sun illumination, which is equivalent to the peak of brightness at high noon on a sunny day. They varied the brightness of the light source to show that the system remained efficient even in low light conditions. When the researchers coupled the electrodes to silicon photovoltaic cells, they achieved solar conversion efficiencies of 3 to 4 percent for 0.35 to 1-sun illumination. Changing the configuration to a high-performance, tandem solar cell connected in tandem yielded a conversion efficiency to hydrocarbons and oxygenates exceeding 5 percent at 1-sun illumination. “We did a little dance in the lab when we reached 5 percent,” said Ager, who also holds an appointment as an adjunct professor at UC Berkeley’s Materials Science and Engineering Department. Among the new components developed by the researchers are a copper-silver nanocoral cathode, which reduces the carbon dioxide to hydrocarbons and oxygenates, and an iridium oxide nanotube anode, which oxidizes the water and creates oxygen. “The nice feature of the nanocoral is that, like plants, it can make the target products over a wide range of conditions, and it is very stable,” said Ager. The researchers characterized the materials at the National Center for Electron Microscopy at the Molecular Foundry, a DOE Office of Science User Facility at Berkeley Lab. The results helped them understand how the metals functioned in the bimetallic cathode. Specifically, they learned that silver aids in the reduction of carbon dioxide to carbon monoxide, while the copper picks up from there to reduce carbon monoxide further to hydrocarbons and alcohols. Because carbon dioxide is a stubbornly stable molecule, breaking it up typically involves a significant input of energy. Notably, the electrodes operated well in water, a neutral pH environment. The researchers customized the anode by growing the iridium oxide nanotubes on a zinc oxide surface to create a more uniform surface area to better support chemical reactions. Other co-authors on the study include James Bullock, a Berkeley Lab postdoctoral researcher in materials sciences, who was instrumental in engineering the system’s photovoltaic and electrolysis cell pairing. Bullock works in the lab of study co-author Ali Javey, Berkeley Lab senior faculty scientist and a UC Berkeley professor of electrical engineering and computer sciences. This work is supported by the DOE Office of Science. Lawrence Berkeley National Laboratory addresses the world’s most urgent scientific challenges by advancing sustainable energy, protecting human health, creating new materials, and revealing the origin and fate of the universe. Founded in 1931, Berkeley Lab’s scientific expertise has been recognized with 13 Nobel Prizes. The University of California manages Berkeley Lab for the U.S. Department of Energy’s Office of Science. For more, visit http://www.lbl.gov. This entry was posted in Nanotechnology and tagged breakthrough discovery, Environment, Genesis Nanotechnology, Lawrence Berkeley National Laboratory, Nanomaterials, Nanotechnology, Renewable Energy.